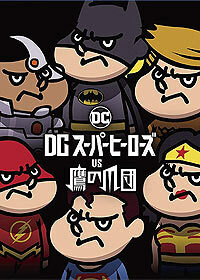 DC Super Heroes vs. Taka No Tsumedan (2017) - Sci-fi-central.com. Japan  2017  105m   Directed by: Frogman.  Starring: Takayuki Yamada, Ken Yasuda, Jiyoung Kang..
Eagle Talon feels like a really bad spoof of Justice League. Superman punching and defeating enemies like he is some kind of playable Matrix character and the whole japanese faces of either crying or trying to smile reminded me an equal bad DC spoof called 'Teen Titans Go!' avoid this one like the plague. Review by BatmanFunReviews from the Internet Movie Database.